Today I’m excited to announce the launch of World of the Weasel, a series of picture books for kids and the adults who read to them! Just a couple of years ago, my writing partner James Munn and I kicked around ideas for a story about a boy and his secret wily pet. It’s been an adventure to turn this idea into something tangible. In the intervening time, we wrote, wrote, and re-wrote. We started a company, Spitball Studio, to publish the books. And we partnered with the massively talented illustrator Dave Leonard to bring our first book to life. 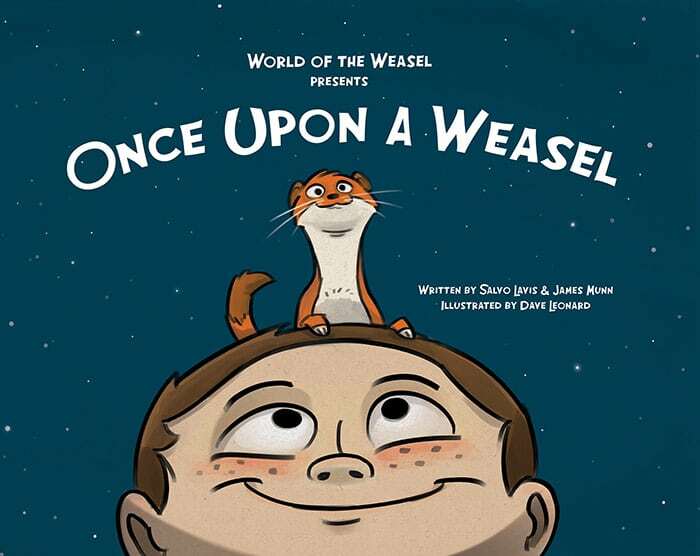 Once Upon a Weasel is a picture book about a misfit boy who, in a spontaneous moment, buys a secret pet that sparks a series of fantasy adventures where the two travel through space and dream of living on the moon. Back on planet Earth, trouble arises when the boy’s pet escapes during a class field trip and turns an entire science museum upside down. On November 1st, Once Upon a Weasel will be available as a beautiful hardcover book. Get updates on the project: If social media is your thing, you can follow us on Facebook or Twitter. We’ll share blog posts about the creative process, book availability, weasels, and more. And if you want occasional email updates in your inbox (we won’t spam! ), please sign up for our email list. If you do read our book, we kindly request that you leave a review on the Apple or Amazon store for others to see. Finally, if you know of bookstores, bloggers, reviewers, reading groups, schools, or book fairs that might be interested in Once Upon a Weasel, please let me know.